Owney and RPO friends. Smithsonian Postal Museum Photo. 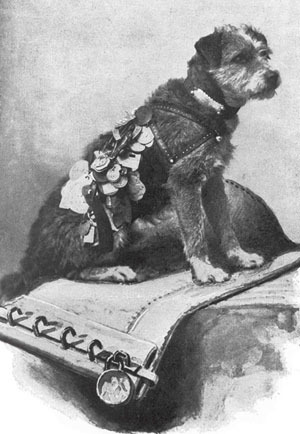 A few years ago there was a children's book published about Owney the mail dog who traveled the country on Railway Post Office cars in the 1890s. The story goes he was adopted by the clerks that worked the RPO cars. He was attracted to the smell of mail bags and wherever there were mail bags he was at home. He would ride the RPO cars going around the country. It turns out there really was an Owney and according to the Columbus Dispatch of September 19, 1894, he even paid a visit to Columbus, Ohio. The Dispatch article contradicts the Smithsonian Postal Museum version of the story which states Owney was never in a train wreck. However, the Dispatch does agree with the Smithsonian that Owney was well traveled. Owney on a mail bag with his tag collection. Smithsonian Postal Museum Photo. 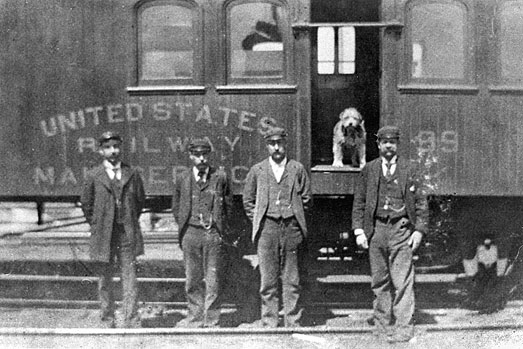 "Owney," the famous mail dog, arrived in Columbus to-day from Athens, over the Toledo & Ohio Central, where he has been spending a few days. "Owney" is one of the most widely known dogs in the United States. For the past eight or ten years he has traveled constantly and always in mail cars. Twice has he crossed the Atlantic Ocean, and both times he persisted in riding with the mail clerks. He has been over every railroad in the United States and will ride only with mail clerks, all of whom know him, feed and care for him. The dog's neck is freighted with medals given by admirers in all parts of the country. "Owney" is a fox terrier and originally came from Albany, New York, which point he makes his headquarters. Several years ago in a wreck in Canada the dog had the sight of his right eye destroyed. To read more about Owney click here.